An international team of scientists including David Q. Matus, Ph.D., and Benjamin L. Martin, Ph.D., in the Department of Biochemistry and Cell Biology and Stony Brook University Cancer Center researchers, have developed a new cell imaging technology combining lattice light sheet microscopy (LLSM) and adaptive optics (AO) to create high-resolution "movies" of cells in their 3-D environment that also captures subcellular processes. Published in Science, the research reveals a technology that shows the phenotypic diversity within cells across different organisms and developmental stages and in conditions such as mitosis, immune processes and in metastases. In the paper, the paper, titled "Observing the Cell in Its Native State: Imaging Subcellular Dynamics in Multicellular Organisms," Professors Matus and Martin used AO-LLSM to capture and visualize the behavior of human breast cancer cells injected into zebrafish vasculature. 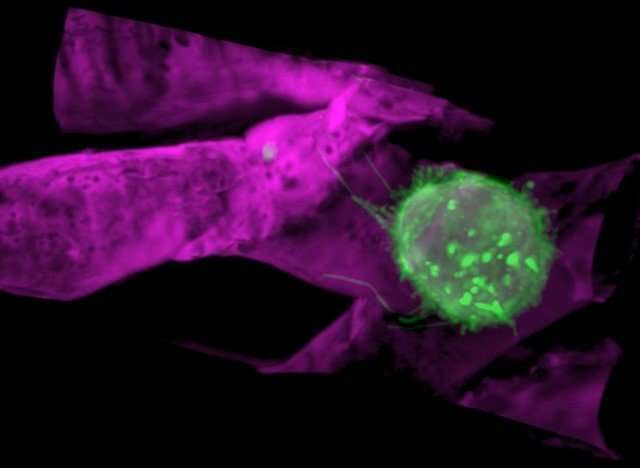 "By observing and characterizing these behaviors, such as cancer cells adopting leukocyte-like behaviors, we may be able to discover new avenues to target the spread or dissemination of metastatic cancer cells," says Matus.